investigator on the National Science Foundation grant. A complex and interdisciplinary subject, climate science is not easy to teach. Nonetheless, University of South Florida Geology Professor and Department Chair Jeffrey Ryan says it is essential for people to have a basic, scientific grasp of the environmental changes taking place and their impacts so they can make critical decisions affecting their lives. Helping people make those connections -- educating students, teachers and the general public about global climate change and its impact -- is at the heart of a new National Science Foundation (NSF) program: The Climate Change Education Partnership. And thanks to a recent $974,000 grant, USF is on the ground floor of the innovative education initiative. An interdisciplinary team of faculty from three USF colleges -- Arts and Sciences, Education and Marine Science -- was awarded the grant to develop implementable education and outreach plans related to climate change. The team, which includes the Hillsborough County School System, the Florida Aquarium and the University of Puerto Rico, represents one of 15 projects nationwide selected to participate in the NSF initiative. Ryan is lead investigator, with co-principal investigators Feldman, Frank Muller-Karger from the College of Marine Science, and Fernando Gilbes from the University of Puerto Rico. Their project is called the Coastal Areas Climate Change Education (CACCE) Partnership. 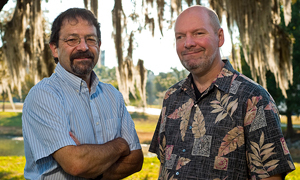 The USF-led team will focus on the impacts of climate change in coastal areas with sea level change as its core theme. The same is true for freshwater resources. “Changing rainfall patterns affect the recharging of the Florida aquifer. And that can affect things like whether a sinkhole opens up if you pump too much water out of the aquifer, as happened across Hillsborough County last winter,” said Ryan. The objectives of the USF project are threefold. “The first goal is gathering the information that’s already out there about how to teach people of all ages, students and adults, about climate change,” Feldman said. This inventory of educational resources will become part of a USF CACCE portal to be hosted in by the USF Library. The second part of the project is to develop and pilot new approaches for engaging students, educators and citizens in climate-related issues and helping them learn about climate change and its effects on coastal regions. And the third objective is to develop broader partnerships, geographically spanning the Gulf and Caribbean, and including private sector organizations, governmental agencies and educational institutions -- schools, as well as educators in informal learning settings such as museum and parks. Current community partners, Hillsborough County Schools led by science coordinator Larry Plank; and the Florida Aquarium, led by vice president for education Debbi Stone, will help gather information about citizen’s perceptions of climate change and will serve as sites for testing new educational methods.